Go off the beaten path and experience sustainability in action. Spend a semester in Costa Rica, home to rainforests, volcanoes, rushing waterfalls, and a laid-back culture that reflects the national motto: “Pura Vida.” Explore the country’s many diverse parks, farms, and reserves to learn how Costa Ricans have balanced conservation and development issues. Wrap up the semester in the field, collecting data for a research project that will help inform future sustainability efforts. Amber grew up on a small family farm in Prairie Farm, Wisconsin. She attended Boston University and earned a degree in Environmental Analysis and Policy. 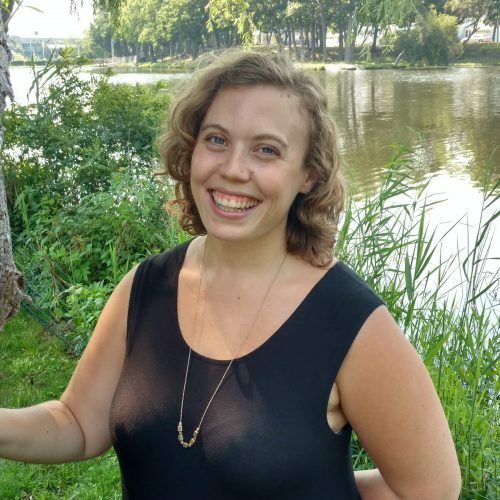 She learned to love the natural world early in life and during her time at BU she studied abroad twice, once in Grenoble, France and once with SFS in Atenas, Costa Rica in 2012. She was lucky enough to work on two Directed Research projects during her time with SFS in Costa Rica. 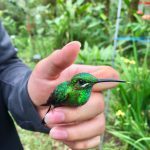 One to contribute to an ecological assessment of the impacts of hummingbird feeders on pollination networks in Cloud Forests in Monteverde and another studying the impacts of trafficked roads bisecting or bordering the forest of Carara National Park. During her career she has worked in student leadership development, run community organizing efforts, and spent time on several small farms (including her family farm in the Midwest) rediscovering her agricultural roots. She returned to SFS as an Admissions Counselor in 2015. Her experience in the field and abroad was transformative and she is delighted to have the opportunity to work to support students through the admissions and pre-departure process and share her experience with the next generation! In her free time, she loves to cook, bake, hike, read, play ukulele, pet dogs, see live music, and be outside. This academically rigorous program follows a six-day/week schedule. 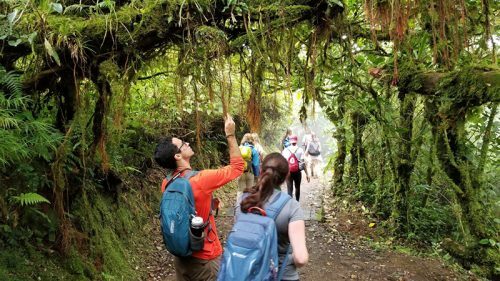 The interdisciplinary curriculum is designed to help students actively discover and understand the complexities of environmental, social, and economic issues in Costa Rica. On the Sustainable Development Studies program, you will take three 4-credit disciplinary courses, one 2-credit language and culture course, and a 4-credit capstone Directed Research course. Courses are participatory in nature and are designed to foster inquiry and active learning. Each course combines lectures, field exercises, assignments, tests, and research. All courses are taught in English. This course contains two distinct but integrated modules. The Spanish language module offers listening, oral, and written practice of the Spanish language at beginner, intermediate, and advanced levels of proficiency. Students engage in oral and written grammar and vocabulary exercises, and develop Spanish language skills and tools required for their research projects. The sociocultural module helps students to develop a more refined understanding of Costa Rican culture and the various communities with which we work. Students participate in lectures, field exercises, and other activities including a homestay—all of which teach them strategies and skills for working with people in a community-based research context and help them to assist with community extension projects. This course is designed to examine the connection between society and natural resources, and how application of management tools can lead to biodiversity conservation and sustainable livelihoods. This course introduces underlying concepts and practical tools used in addressing complex environmental problems, including protected area planning and management, guidelines for ecologically sustainable development, and environmental impact assessment. Students examine local case studies using the theory and practice learned in this course. large-scale impact of local agricultural and other practices on the national and global environment (e.g., water pollution, waste management, climate change). Students examine options for alternative resources use, land restoration, and preservation from ecological, sociopolitical, and economic viewpoints, and use basic field techniques and measurements to examine the efficacy of different options. 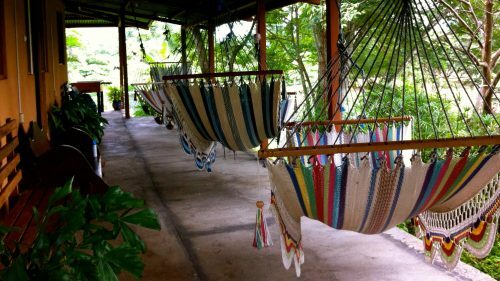 This course addresses the intersection of the human and environmental sides of sustainable development in Costa Rica. Linking human rights to sustainability is an emerging field that combines the important dimensions of economic and social rights with the environmental underpinnings of sustainability. We use a multidisciplinary methodology to cover themes of local and global social and environmental policies, valuing of and access to ecosystem services, development aid, agrarian reform, indigenous rights and local livelihoods, and climate change. Students examine the roles of local people, government, and local and international non-governmental actors in the implementation of sustainable development models. Students also review specific local case studies to explore the empowerment of local people and their reaction to local and non-local proposals for sustainable development. This course prepares students to distinguish hidden assumptions in scientific approaches and separate fact from interpretation, cause from correlation, and advocacy from objectivity. Students learn specific tools including: experimental design; field techniques; basic descriptive statistics; and parametric and non-parametric quantitative analysis. Emphasis is placed on succinct scientific writing, graphic and tabular presentation of results, and effective delivery of oral presentations. You will gain practical skills in the field such as: GIS use and applications, habitat and biodiversity assessment, research design and implementation, forest soundscape techniques, songbird mist-netting, quantitative and qualitative data collection and analysis, tourism impact assessment methods, research presentation, and Spanish language skills. You will visit different ecosystems and communities, which may include low-land tropical rainforest, tropical cloud forest, the rainforest on the Pacific coast, dry forest on the Guanacaste Peninsula, communities surrounding national parks, agroecosystems, fishing villages, farms, volcanoes, mangroves and coastal ecosystems. In the Directed Research course, each student completes a field research project under the mentorship of a faculty member – beginning with data collection and analysis and concluding with a research paper and presentation. Project subject areas span ecology, natural resource management, conservation science, environmental ethics, and socioeconomics. The Center is an active organic farm overlooking the vibrant Central Valley, where green is the predominant color as far as the eye can see. Dorms and classrooms intermingle with orchards and gardens, while Center dog Hera keeps watch over it all. The friendly town of Atenas is a 10-minute cab ride away, offering restaurants, shops, parks, and cultural events. Click on the icons below to learn more about our Center in Costa Rica.